Usually teenage boys will do anything to avoid their mothers. Justin Bieber, 19, wants his watching his every move. 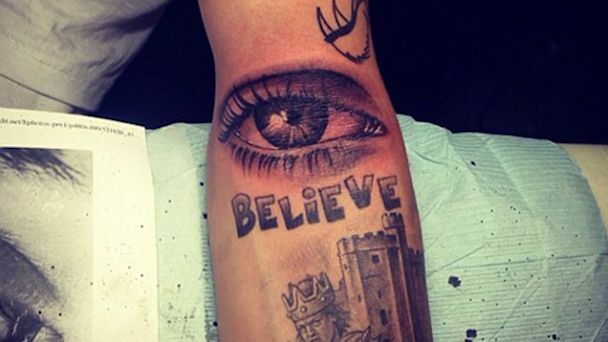 After months of acting out, including run-ins with the paparazzi and angry neighbors, the "Baby" singer paid a tribute to his mother Pattie Mallette, getting a tattoo of her eye on the inside of his left elbow. Bieber chose Bang Bang in NYC, the same tattoo shop that did his "Believe" ink that now sits beneath the eye on his forearm. After the tattoo was finished, Bieber posted a picture Wednesday on Instagram with the caption "Moms always watching ;)"
Bang Bang also posted a pic on the shop's Facebook account, showing the "Never Say Never" star posing with tattoo artist Keith McCurdy. The Biebs has been in a bit of hot water lately, most recently apologizing to former President Bill Clinton after a video was discovered of him yelling obscenities about Clinton while urinating into a bucket. Questions about Bieber's personal life still loom, as well. Earlier this month, Bieber posted a picture of himself and ex-girlfriend Selena Gomez with one word attached - "Heartbreaker." Since then, there's been no word on a possible reunion.